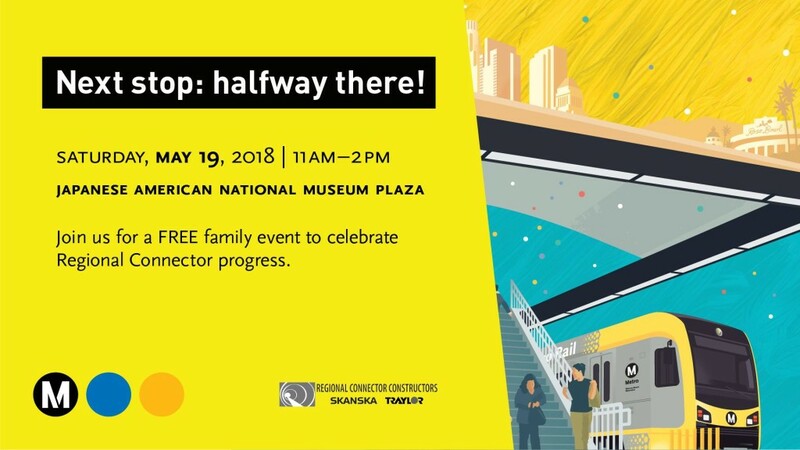 Join us in celebrating the construction progress of the Regional Connector Transit Project. Come out for FREE family fun, art-making, workshops, music, dance performances and more. Take the Metro Gold Line to the Little Tokyo/Arts District Station and enjoy an afternoon filled with performances from local musicians, art-making with Metro artists, raffles and so much more. Silent Disco yoga led by JQ Williams—with instruction and music on wireless headphones. Bring your own yoga mat. RSVP required. Construction on the Regional Connector Transit Project is now 50 percent complete and will connect the Blue, Expo and Gold Lines via twin tunnels below downtown Los Angeles. The tunnels will make light rail trips to and through downtown Los Angeles faster with far fewer transfers for most riders. The project is forecast to be completed by December 2021.